Hope Beyond Hype - A comic about stem cells from discovery to therapy! The story provides a realistic and accurate introduction to the complex process of developing best practice clinical stem cell-based treatments, in an interesting and engaging way. We believe it is important to engage people with our work and therefore hope the graphic story will be useful for public events, new patients and carers, patient advocacy groups, educationalists, public engagement practitioners and researchers. Also available in 17 other languages! Print copies available for purchase on the University of Edinburgh's ePay site. Make your own classroom activity or card game! See the attached files below! The Hope Beyond Hype graphic story grew from the desire of OptiStem, a large European consortium of stem cell researchers, to go beyond just explaining the science of stem cells. They wanted to depict the process they undertake as they try to move stem cell research on towards clinical trials and therapies. Read Ken MacLeod's account of producing the comic. Listen to Ken MacLeod and Edward Ross discussing the comic with Alex Fitch in this Panel Borders podcast. Written by Ken Macleod, with Jamie Hall, Edward Ross and Cathy Southworth. Illustrated by Edward Ross. 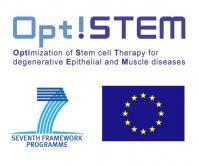 OptiStem is a pan-European stem cell research project funded by the European Commission under FP7. It brought together scientists, companies and clinicians from 18 institutions across six countries. During the course of the five year OptiStem project, members carried out four different clinical trials concerning muscular dystrophy, severe corneal injury in the eye and severe damage to the oral mucosa (inside of mouth). OptiStem partnered with EuroStemCell to tell people about their work.